In England, Studio Schools (a model similar to U.S. charter schools) combine academic and vocational pathways with strong employer engagement to make learning relevant. There is no shortage of qualities that today's learners need in order to successfully navigate their way through school, into a career, and through life. As global citizens who should value cultural differences and weigh up opposing perspectives, they must be resourceful, inventive problem solvers who can think conceptually and are at ease with a bit of ambiguity. They must also be adaptive and resilient in order to manage a fast-paced global economy. There is also, however, general acknowledgement that many of today's schools are woefully ill prepared to meet the challenge of preparing learners for what lies ahead. The sheer speed at which many industries innovate makes it difficult for schools to keep up, a shortcoming frequently underscored by employers. In the U.K., employers routinely report skill-shortage vacancies, particularly job-specific and technical skills. (See the U.K. Commission's Employer Skills Survey 2013: U.K. results.) Yet surprisingly, a recent study of employers in England revealed that word of mouth remains a primary recruitment channel. (See UKCES Employer Perspectives Survey 2014: England.) For young people who may rightly see no hope or prospects for themselves in this landscape -- a landscape of schools that offer little in the way of clear links between their learning and life after school, and the absence of advantageous social connections -- what can be done to bridge this disconnect? For the past six years, a quiet transformation has been shaping up in England, undoing many conventional notions of what schooling should look like. In Huddersfield and Newcastle, Manchester and Warrington, London and Rye, across the Midlands, Merseyside, Somerset, and Oxfordshire, Studio Schools are changing the balance of the usual educational equation by putting the link between academics and work at the center of learning. 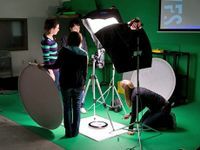 Creative & Media Studio School - NLC Media (0.75 Speed) from Studio Schools Trust on Vimeo. Studio Schools are small, non-selective schools designed for students aged 14-19. Similar to charter schools in the U.S., Studio Schools are publicly funded and have greater autonomy than schools governed by local authorities, but all are established by the state, in this case the Department for Education in England, and all follow the national curriculum. (See more on the academies program in England and the national curriculum for secondary education in England.) The name takes its inspiration from the studios of the Renaissance where learning and work were thoroughly integrated. Every Studio School offers specialist pathways -- engineering, health, creative and digital industries, computing, performing arts, finance, and aerospace -- based on local demand in skills shortage sectors. Each Studio School delivers its specialism alongside the national curriculum so that, upon completion, students gain the same core academic qualifications as their peers in mainstream schools, but also the technical and vocational qualifications that many employers value. But there's more. What Makes a Studio School? Employers are essential partners to Studio Schools from conception through opening. They range from large finance and construction multinationals to three-person start-ups in gaming and design, reflecting the dynamism and work practices of each accordingly. This gives students ample opportunity to apply their learning in a range of ways relevant to them and to employers. Students participate in project briefs commissioned by employers and in work placements to gain valuable hands-on experience. Employers also mentor students and lead master classes that further bridge the gap between what students are learning in their classes and how this applies to the larger world. In some instances, they may also participate in curriculum development to help ensure that the link between curricular content and qualifications remains relevant. Additionally, employers sit on school governing bodies to provide ongoing guidance and support. 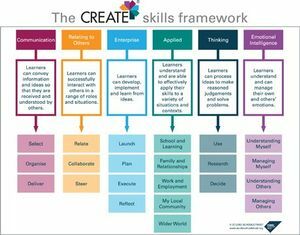 The "A" in CREATE is for Applied, or the ways in which students apply their learning at school, at home, at work, in their local communities, and in the wider world. The framework is integral to reinforcing all aspects of the Studio Schools learning model. While PBL is acknowledged as a powerful teaching and learning model across the U.S., it currently has less traction in England. Envision Schools, New Tech Network, and Expeditionary Learning are just three examples of organizations that support schoolwide models of PBL, but there are other networks, districts, and schools across the U.S. that promote the value of learning through inquiry rooted in real life. PBL is an important approach that reinforces what learning in Studio Schools is all about: challenging students to apply their knowledge and demonstrate their understanding in multiple ways that have real-world relevance. In Studio Schools, personal coaching helps build an aspirational schoolwide culture of learning. Every student in a Studio School has a personal coach who ensures an individualized learning program to support academic, social, and personal development. Personal coaches lead group and one-to-one coaching sessions using the CREATE Skills Framework as a basis for coaching conversations. Through personal coaching, students are able to develop their own self-awareness, build strong relationships with their peers and with adults, and take greater ownership of their learning and personal development. By design, Studio Schools provide a dynamic environment where learning is rigorous and creative. They may not be the right option for all students, but for many they provide a route into post-secondary options previously out of reach. Studio Schools are bridging the divide between young people's aspirations and opportunities to pursue their goals by helping them develop the attitude, experience, and competence they need to make informed choices about their futures. Editor’s Note: For more information about the WISE initiative's focus on global innovations in education, visit their website.